Large-scale trajectory data generated from various mobility sensors (e.g., GPS, WiFi, smart cards) offer unprecedented opportunities for understanding and improving urban mobility. This research aims to develop AI and machine learning models that can learn complex mobility patterns from massive trajectory data and predict individual movement of people and vehicles to enable smarter traffic management and mobility services. Using deep learning technologies, we develop models to predict the next locations of a moving object given its previous locations, which can be used in various applications such as city-wide traffic flow prediction, intersection turning movement prediction, and personalized route recommendation. Choi, S., Yeo, H., Kim, J., 2018. 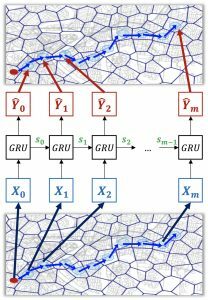 Network-Wide Vehicle Trajectory Prediction in Urban Traffic Networks using Deep Learning. Transportation Research Record: Journal of the Transportation Research Board (in press).